One of the most praised of tropical fruits, and certainly the most esteemed fruit in the family Guttiferae, the mangosteen, Garcinia mangostana L., is almost universally known or heard of by this name. There are numerous variations in nomenclature: among Spanish-speaking people, it is calledmangostan; to the French, it is mangostanier, mangoustanier, mangouste or mangostier; in Portuguese, it is mangostao, mangosta or mangusta; in Dutch, it is manggis or manggistan; in Vietnamese, mang cut; in Malaya, it may be referred to in any of these languages or by the local terms,mesetor, semetah, or sementah; in the Philippines, it is mangis or mangostan. Throughout the Malay Archipelago, there are many different spellings of names similar to most of the above. The mangosteen tree is very slow-growing, erect, with a pyramidal crown; attains 20 to 82 ft (6-25 m) in height, has dark-brown or nearly black, flaking bark, the inner bark containing much yellow, gummy, bitter latex. The evergreen, opposite, short-stalked leaves are ovate-oblong or elliptic, leathery and thick, dark-green, slightly glossy above, yellowish-green and dull beneath; 3 1/2 to 10 in (9-25 cm) long, 1 3/4 to 4 in (4.5-10 cm) wide, with conspicuous, pale midrib. New leaves are rosy. Flowers, 1 1/2 to 2 in (4-5 cm) wide and fleshy, may be male or hermaphrodite on the same tree. The former are in clusters of 3-9 at the branch tips; there are 4 sepals and 4 ovate, thick, fleshy petals, green with red spots on the outside, yellowish-red inside, and many stamens though the aborted anthers bear no pollen. The hermaphrodite are borne singly or in pairs at the tips of young branchlets; their petals may be yellowish-green edged with red or mostly red, and are quickly shed. The fruit, capped by the prominent calyx at the stem end and with 4 to 8 triangular, flat remnants of the stigma in a rosette at the apex, is round, dark-purple to red-purple and smooth externally; 1 1/3 to 3 in (3.4-7.5 cm) in diameter. The rind is 1/4 to 3/8 in (6-10 mm) thick, red in cross-section, purplish-white on the inside. It contains bitter yellow latex and a purple, staining juice. There are 4 to 8 triangular segments of snow-white, juicy, soft flesh (actually the arils of the seeds). The fruit may be seedless or have 1 to 5 fully developed seeds, ovoid-oblong, somewhat flattened, 1 in (2.5 cm) long and 5/8 in (1.6 cm) wide, that cling to the flesh. The flesh is slightly acid and mild to distinctly acid in flavor and is acclaimed as exquisitely luscious and delicious. The place of origin of the mangosteen is unknown but is believed to be the Sunda Islands and the Moluccas; still, there are wild trees in the forests of Kemaman, Malaya. Corner suggests that the tree may have been first domesticated in Thailand, or Burma. It is much cultivated in Thailand–where there were 9,700 acres (4,000 ha) in 1965–also in Kampuchea, southern Vietnam and Burma, throughout Malaya and Singapore. The tree was planted in Ceylon about 1800 and in India in 1881. There it succeeds in 4 limited areas–the Nilgiri Hills, the Tinnevelly district of southern Madras, the Kanya-kumani district at the southernmost tip of the Madras peninsula, and in Kerala State in southwestern India. The tree is fairly common only in the provinces of Mindanao and Sulu (or Jolo) in the Philippines. It is rare in Queensland, where it has been tried many times since 1854, and poorly represented in tropical Africa (Zanzibar, Ghana, Gabon and Liberia). There were fruiting trees in greenhouses in England in 1855. 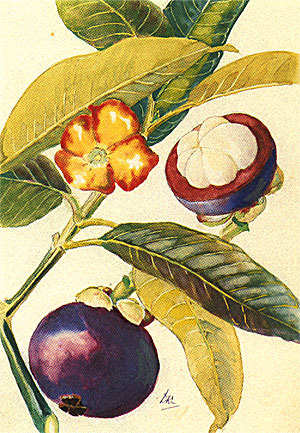 The mangosteen was introduced into Trinidad from the Royal Botanic Garden at Kew, England, between 1850 and 1860 and the first fruit was borne in 1875. It reached the Panama Canal Zone and Puerto Rico in 1903 but there are only a few trees in these areas, in Jamaica, Dominica and Cuba, and some scattered around other parts of the West Indies. The United States Department of Agriculture received seeds from Java in 1906 (S.P.I. #17146). A large test block of productive trees has been maintained at the Lancetilla Experimental Station at Tela, Honduras, for many years. Quite a few trees distributed by the United Fruit Company long ago have done well on the Atlantic coast of Guatemala. In 1924, Dr. Wilson Popenoe saw the mangosteen growing at one site in Ecuador. In 1939, 15,000 seeds were distributed by the Canal Zone Experiment Gardens to many areas of tropical America. It is probable that only a relatively few seedlings survived. It is known that many die during the first year. Dr. Victor Patiño has observed flourishing mangosteen trees at the site of an old mining settlement in Mariquita, Colombia, in the Magdalena Valley and the fruits are sold on local markets. Dierberger Agricola Ltda., of Sao Paulo, included the mangosteen in their nursery catalog in 1949. Despite early trials in Hawaii, the tree has not become well acclimatized and is still rare in those islands. Neither has it been successful in California. It encounters very unfavorable soil and climate in Florida. Some plants have been grown for a time in containers in greenhouses. One tree in a very protected coastal location and special soil lived to produce a single fruit and then succumbed to winter cold. Despite the oft-repeated Old World enthusiasm for this fruit, it is not always viewed as worth the trouble to produce. In Jamaica, it is regarded as nice but overrated; not comparable to a good field-ripe pineapple or a choice mango. According to Corner, the fruit from seedling trees is fairly uniform; only one distinct variation is known and that is in the Sulu Islands. The fruit is larger, the rind thicker than normal, and the flesh more acid; the flavor more pronounced. In North Borneo, a seemingly wild form has only 4 carpels, each containing a fully-developed seed, and this is probably not unique. The mangosteen is ultra-tropical. It cannot tolerate temperatures below 40º F (4.44º C), nor above 100º F (37.78º C). Nursery seedlings are killed at 45º F (7.22º C). It is limited in Malaya to elevations below 1,500 ft (450 m). In Madras it grows from 250 to 5,000 ft (76-1,500 m) above sea-level. Attempts to establish it north of 200 latitude have all failed. It ordinarily requires high atmospheric humidity and an annual rainfall of at least 50 in (127 cm), and no long periods of drought. In Dominica, mangosteens growing in an area having 80 in (200 cm) of rain yearly required special care, but those in another locality with 105 in (255 cm) and soil with better moisture- holding capacity, flourished. Technically, the so-called "seeds" are not true seeds but adventitious embryos, or hypocotyl tubercles, inasmuch as there has been no sexual fertilization. When growth begins, a shoot emerges from one end of the seed and a root from the other end. But this root is short-lived and is replaced by roots which develop at the base of the shoot. The process of reproduction being vegetative, there is naturally little variation in the resulting trees and their fruits. Some of the seeds are polyembryonic, producing more than one shoot. The individual nucellar embryos can be separated, if desired, before planting. Inasmuch as the percentage of germination is directly related to the weight of the seed, only plump, fully developed seeds should be chosen for planting. Even these will lose viability in 5 days after removal from the fruit, though they are viable for 3 to 5 weeks in the fruit. Seeds packed in lightly dampened peat moss, sphagnum moss or coconut fiber in airtight containers have remained viable for 3 months. Only 22% germination has been realized in seeds packed in ground charcoal for 15 days. Soaking in water for 24 hours expedites and enhances the rate of germination. Generally, sprouting occurs in 20 to 22 days and is complete in 43 days. Because of the long, delicate taproot and poor lateral root development, transplanting is notoriously difficult. It must not be attempted after the plants reach 2 ft (60 cm). At that time the depth of the taproot may exceed that height. There is greater seedling survival if seeds are planted directly in the nursery row than if first grown in containers and then transplanted to the nursery. The nursery soil should be 3 ft (1 m) deep, at least. The young plants take 2 years or more to reach a height of 12 in (30 cm), when they can be taken up with a deep ball of earth and set out. Fruiting may take place in 7 to 9 years from planting but usually not for 10 or even 20 years. Conventional vegetative propagation of the mangosteen is difficult. Various methods of grafting have failed. Cuttings and air-layers, with or without growth-promoting chemicals, usually fail to root or result in deformed, short-lived plants. Inarching on different rootstocks has appeared promising at first but later incompatibility has been evident with all except G. xanthochymus Hook. f. (G tinctoria Dunn.) or G. lateriflora Bl., now commonly employed in the Philippines. In Florida, approach-grafting has succeeded only by planting a seed of G. xanthochymus about 1 1/4 in (3 cm) from the base of a mangosteen seedling in a container and, when the stem of the G. xanthochymus seedling has become 1/8 in (3 mm) thick, joining it onto the 3/16 to 1/4 in (5-6 mm) thick stem of the mangosteen at a point about 4 in (10 cm) above the soil. When the graft has healed, the G. xanthochymus seedling is beheaded. The mangosteen will make good progress having both root systems to grow on, while the G. xanthochymus rootstock will develop very little. A spacing of 35 to 40 ft (10.7-12 m) is recommended. Planting is preferably done at the beginning of the rainy season. Pits 4 x 4 x 4 1/2 ft (1.2 x l.2 x l.3 m) are prepared at least 30 days in advance, enriched with organic matter and topsoil and left to weather. The young tree is put in place very carefully so as not to injure the root and given a heavy watering. Partial shading with palm fronds or by other means should be maintained for 3 to 5 years. Indian growers give each tree regular feeding with well-rotted manure–100 to 200 lbs (45-90 kg)–and peanut meal–10 to 15 lbs (4.5-6.8 kg) total, per year. Some of the most fruitful mangosteen trees are growing on the banks of streams, lakes, ponds or canals where the roots are almost constantly wet. However, dry weather just before blooming time and during flowering induces a good fruit-set. Where a moist planting site is not available, irrigation ditches should be dug to make it possible to maintain an adequate water supply and the trees are irrigated almost daily during the dry season. In Malaya and Ceylon, it is a common practice to spread a mulch of coconut husks or fronds to retain moisture. A 16-in (40-cm) mulch of grass restored trees that had begun dehydrating in Liberia. It has been suggested that small inner branches be pruned from old, unproductive trees to stimulate bearing. In Thailand, the tree is said to take 12 to 20 years to fruit. In Panama and Puerto Rico trees grown from large seed and given good culture have borne in six years. At low altitudes in Ceylon the fruit ripens from May to July; at higher elevations, in July and August or August and September. In India, there are 2 distinct fruiting seasons, one in the monsoon period (July-October) and another from April through June. Puerto Rican trees in full sun fruit in July and August; shaded trees, in November and December. Cropping is irregular and the yield varies from tree to tree and from season to season. The first crop may be 200 to 300 fruits. Average yield of a full-grown tree is about 500 fruits. The yield steadily increases up to the 30th year of bearing when crops of 1,000 to 2,000 fruits may be obtained. In Madras, individual trees between the ages of 20 and 45 years have borne 2,000 to 3,000 fruits. Productivity gradually declines thereafter, though the tree will still be fruiting at 100 years of age. Ripeness is gauged by the full development of color and slight softening. Picking may be done when the fruits are slightly underripe but they must be fully mature (developed) or they will not ripen after picking. The fruits must be harvested by hand from ladders or by means of a cutting pole and not be allowed to fall. In dry, warm, closed storage, mangosteens can be held 20 to 25 days. Longer periods cause the outer skin to toughen and the rind to become rubbery; later, the rind hardens and becomes difficult to open and the flesh turns dry. Ripe mangosteens keep well for 3 to 4 weeks in storage at 40º to 55º F (4.44º-12.78º C). Trials in India have shown that optimum conditions for cold storage are temperatures of 39º to 42º F (3.89º-5.56º C) and relative humidity of 85 to 90%, which maintain quality for 49 days. It is recommended that the fruits be wrapped in tissue paper and packed 25-to-the-box in light wooden crates with excelsior padding. Fruits picked slightly unripe have been shipped from Burma to the United Kingdom at 50º to 55º F (10º-12.78º C). From 1927 to 1929, trial shipments were made from Java to Holland at 37.4º F (approximately 2.38º C) and the fruits kept in good condition for 24 days. Few pests have been reported. A leaf-eating caterpillar in India may perhaps be the same as that which attacks new shoots in the Philippines and which has been identified as Orgyra sp. of the tussock moth family, Lymantridae. A small ant, Myrnelachista ramulorum, in Puerto Rico, colonizes the tree, tunnels into the trunk and branches, and damages the new growth. Mites sometimes deface the fruits with small bites and scratches. Fully ripe fruits are attacked by monkeys, bats and rats in Asia. In Puerto Rico, thread blight caused by the fungus, Pellicularia koleroga, is often seen on branchlets, foliage and fruits of trees in shaded, humid areas. The fruits may become coated with webbing and ruined. In Malaya, the fungus, Zignoella garcineae, gives rise to "canker"–tuberous growths on the branches, causing a fatal dying-back of foliage, branches and eventually the entire tree. Breakdown in storage is caused by the fungi Diplodia gossypina, Pestalotia sp., Phomopsis sp., Gloeosporium sp., and Rhizopus nigricans. A major physiological problem called "gamboge" is evidenced by the oozing of latex onto the outer surface of the fruits and on the branches during periods of heavy and continuous rains. It does not affect eating quality. Fruit-cracking may occur because of excessive absorption of moisture. In cracked fruits the flesh will be swollen and mushy. Bruising caused by the force of storms may be an important factor in both of these abnormalities. Fruits exposed to strong sun may also exude latex. Mangosteens produced in Honduras often have crystal-like "stones" in the flesh and they may render the fruit completely inedible. To select the best table fruits, choose those with the highest number of stigma lobes at the apex, for these have the highest number of fleshy segments and accordingly the fewest seeds. The numbers always correspond. Mangosteens are usually eaten fresh as dessert. One need only hold the fruit with the stem-end downward, take a sharp knife and cut around the middle completely through the rind, and lift off the top half, which leaves the fleshy segments exposed in the colorful "cup"–the bottom half of the rind. The segments are lifted out by fork. Phytin (an organic phosphorus compound) constitutes up to 0.68% on a dry-weight basis. The flesh amounts to 31% of the whole fruit. Wood: In Thailand, all non-bearing trees are felled, so the wood is available but usually only in small dimensions. It is dark-brown, heavy, almost sinks in water, and is moderately durable. It has been used to make handles for spears, also rice pounders, and is employed in construction and cabinetwork. Medicinal Uses: Dried fruits are shipped from Singapore to Calcutta and to China for medicinal use. The sliced and dried rind is powdered and administered to overcome dysentery. Made into an ointment, it is applied on eczema and other skin disorders. The rind decoction is taken to relieve diarrhea and cystitis, gonorrhea and gleet and is applied externally as an astringent lotion. A portion of the rind is steeped in water overnight and the infusion given as a remedy for chronic diarrhea in adults and children. Filipinos employ a decoction of the leaves and bark as a febrifuge and to treat thrush, diarrhea, dysentery and urinary disorders. In Malaya, an infusion of the leaves, combined with unripe banana and a little benzoin is applied to the wound of circumcision. A root decoction is taken to regulate menstruation. A bark extract called "amibiasine", has been marketed for the treatment of amoebic dysentery.